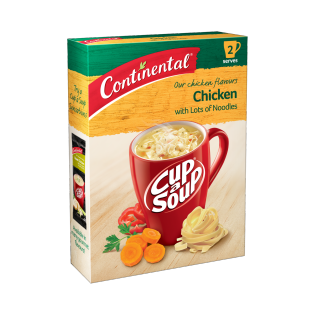 Continental Cup-A-Soup make a satisfying snack whatever time of the day! Try Chicken with Lots of Noodles! Noodles (43%) (wheat^ flour, wheat gluten), maltodextrin, corn starch, vegetables (6%) [onion powder, red capsicum, carrot], sugar, natural chicken flavours, mineral salt (potassium chloride), flavour enhancers (621, 635), salt, hydrolysed corn protein, chicken powder (1%), vegetable oil (sunflower, soybean), parsley, herb extract, colour (turmeric), food acid (lactic). ^ From responsibly grown Australian wheat.